So true. I am a fan of Andy Warhol. For our honeymoon this past August we went to Seattle...we were so lucky to catch the Andy Warhol exhibit at SAM. Vintage photo booth and all! PICK MEEEEEEEE! this is awesome! My mom always asks...."who are THEY anyway"... Now I can tell her "They" means Jen Geigley! I think Andy would be a nice edition to my new house in MN... Don't you?? Love this quote :) Great giveaway!! I like this quote a lot! and the color of this print is one of my favorites! love this! thanks to both of you for the chance to win! This is such a great print! I love her stuff! I love this quote and the yellow would be PERFECT on my wall. Ah, love Steph's work! :) It's always so lovely! My fingers are crossed - thanks, ladies! Love it ... and Steph is fab! What a beautiful print and inspirational quote! I love it! Went to an Andy Warhol museum in Pittsburgh, love his stuff. I know bupkis about Andy Warhol but I love that quote! So awesome! I was just looking at Stephanie's shop and she has a lot of awesome prints. I found another one perfect for a friend's birthday. Thanks! 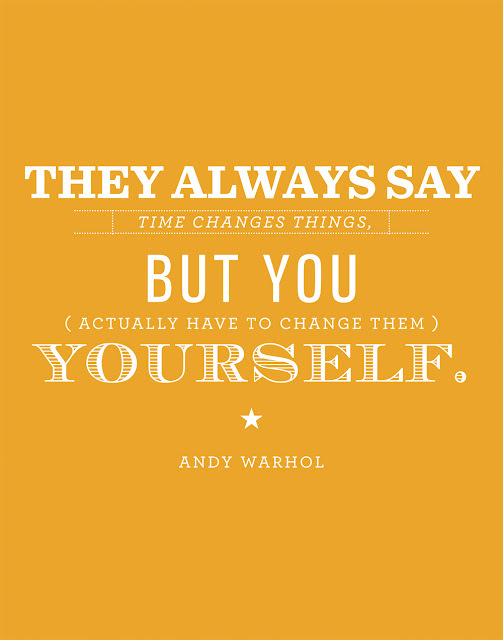 Love Andy Warhol. Love the sentiment. Love the tangerine color! Love this quote, I hope I win! Oh my goodness! Cuuuute prints. One of these would be perfect for my new home office! Definitely adding Stephanie's shop to my favorites :) Thanks for the chance to win! Great quote and cool color!! Loove the quote and mustard color! love the new print's Steph is doing. great choice...thanks for the chance to win one. Great quote and print - thanks for the giveaway! Am I too late? Love Andy Warhol and his genius/madness!